Your Rights Are Written in Stone! To mark the 10th anniversary of the unveiling of the Dublin Human Rights and Poverty Stone on Cutsom House Quay (Dublin 1), the Irish 17 October Committee and ATD are facilitating a series of workshops in the North East Inner City of Dublin. This project is entitled “Your Rights Are Written In Stone”. 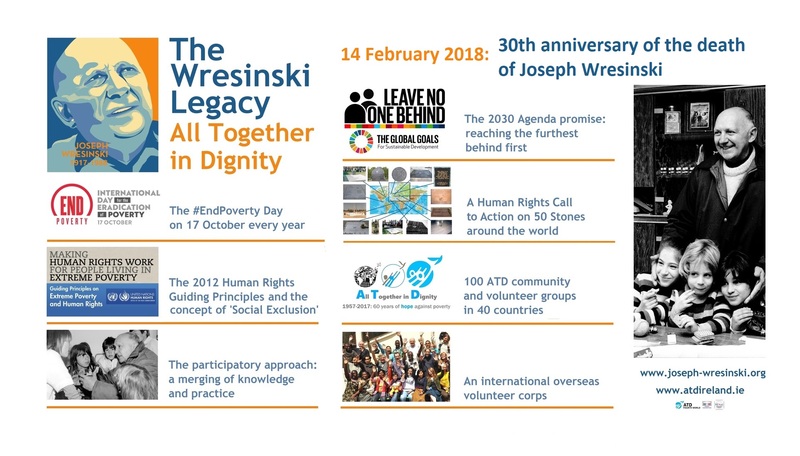 Participants will talk about human rights and poverty and discover ATD’s new exhibition of banners illustrating the history and international context of the Dublin Human Rights and Poverty Stone. Participants will also be invited to write, draw or paint a word, name or image you associate with basic human rights and poverty on a small stone which will be included in a very special exhibition on next End Poverty Day, 17 October 2018. Let’s make the best Irish anti-poverty plan ever! Have your say before Saint Patrick’s Day! 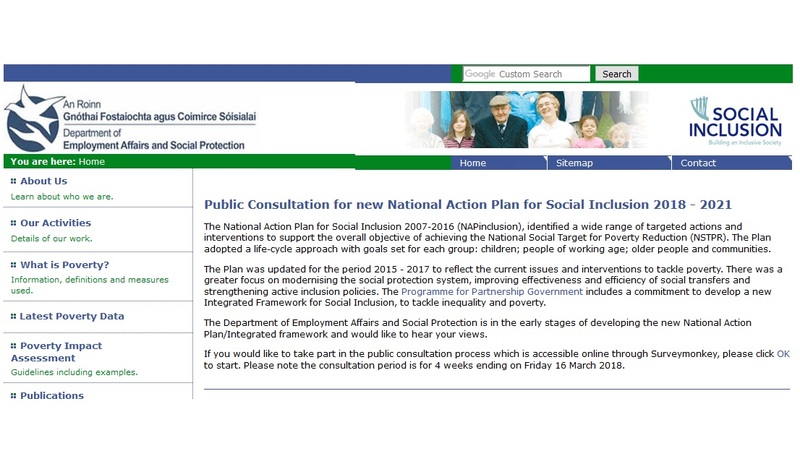 On 16th February 2018, the Irish Government launched its public consultation on a new National Action Plan for Social Inclusion 2018-2021. This move follows the commitment included in the Programme for Partnership Government to develop a new Integrated Framework for Social Inclusion, to tackle inequality and poverty. The former plan quickly named NAPinclusion (National Action Plan for Social Inclusion 2007-2016 and update) identified a wide range of targeted actions and interventions to support the overall objective of achieving the National Social Target for Poverty Reduction (NSTPR). It adopted a life-cycle approach with goals set for each group: children; people of working age; older people and communities. The focus of the last implementation years of this plan was on modernising the social protection system, improving effectiveness and efficiency of social transfers and strengthening active inclusion policies. Now the Department of Employment Affairs and Social Protection is in the early stages of developing the new National Action Plan/Integrated framework and would like to hear views of the civil society (citizens and organisations). The consultation is by Survey Monkey with a deadline of Friday 16th March. A PDF of the Survey questions is available here to assist with the filling in the online survey. Have your say! And join the ATD Walk As One initiative to make the next plan the best ever! 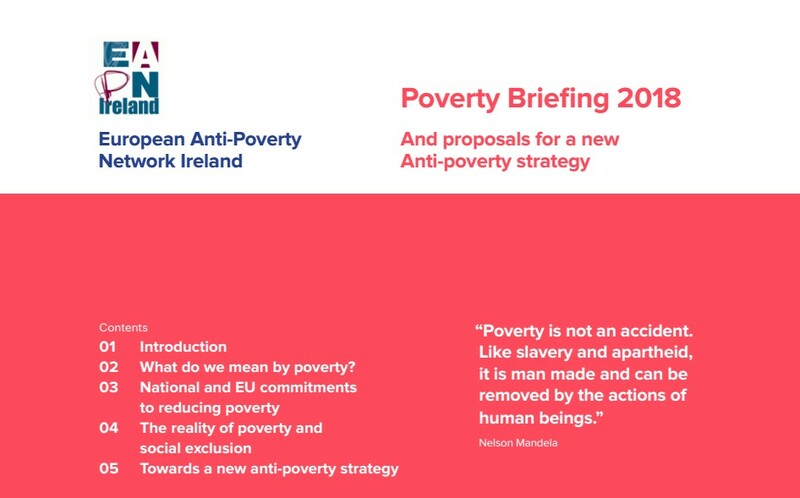 A few days after the launch of the consultation, EAPN Ireland (member of the European Anti-Poverty Network) published its Poverty Briefing 2018 and proposals for a new Anti-Poverty Strategy. A Poverty Briefing published today by the European Anti-Poverty Network (EAPN) Ireland has highlighted that if the Government wants to tackle the high levels of poverty in Ireland it needs to take action at the highest level and across all Government departments. Despite some recent progress the Government is failing in its commitments to tackle poverty, with some groups in society at particular risk. There are currently 394,900 people in consistent poverty in Ireland, including around 141,700 children. Paul Ginnell, the Director of EAPN Ireland stated that “The last social inclusion plan completely failed as the commitment to make it a priority from the top of Government wasn’t there. This time the Government must be serious and the new plan ambitious in its goals and implementation if we are ever to have any chance of eradicating poverty and its causes from our society”. The Poverty Briefing 2018 presents up to date information on the levels of poverty and the issues behind them. It spells out many of the specific issues which impact directly on the lives of people. These relate to inadequate income, lack of access to a range of core services such as health, housing and literacy, numeracy and childcare and the need for quality employment for those who can work. Download the Poverty Briefing 2018 and proposals for a new Anti-Poverty Strategy. The “I Have A Dream” campaign kicked off with its first creative writing workshop facilitated by Fighting Words in Dublin 1. 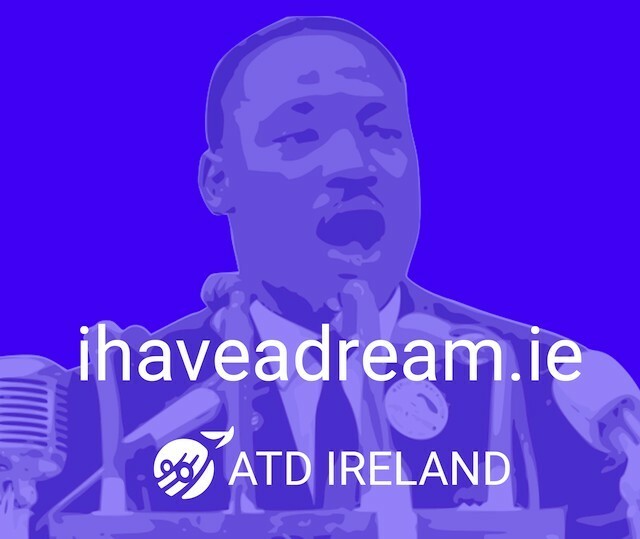 The legacy of Martin Luther King is the inspiration for the ATD Dublin youth group who officially kicked off their creative writing campaign Ireland, I Have a Dream on Tuesday 13th February. 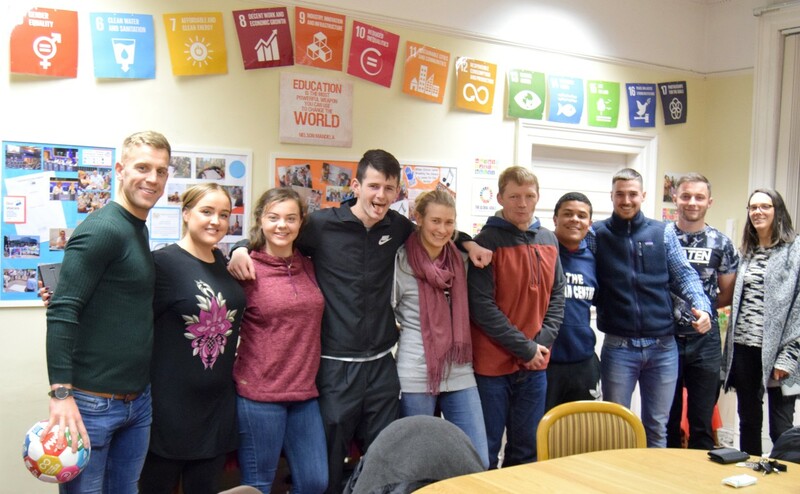 The Unity in the Community youth group are an ATD project run from the ATD office in Dublin’s North inner city. Participants in Ireland, I Have a Dream will be encouraged to write about the dreams they have to stop persistent poverty in Ireland through the context of their own story. The movement began on the 13th February with a booked out creative writing workshop administered by Fighting Words, which provides free tutoring and mentoring in creative writing and related arts. The project runs from now until the 4th of April (the 50th anniversary of the assassination of Martin Luther King) with a launch event and publication of speeches in May 2018. Later the publication will be presented at the European Parliament in Strasbourg during the YO Fest 2018 and the EYE 2018. For all information about how to take part, guidelines, latest news and details of workshops visit ihaveadream.ie. Although most famous for his work in civil rights, Martin Luther King was also an anti-poverty activist. On the 50th year of the anniversary of his death, the youth group explored the legacy of Martin Luther King and were inspired by his infamous ‘I, Have a Dream speech’. The group decided to start a campaign in which they could use their creative mind and voice to connect ‘I Have A Dream’ to their own lives. The ATD Youth Group will attempt to help young people to find strength in sharing their experiences, finding their singular and unified voices. The campaign is designed to provide a new space in Ireland for young people between the ages of 16-25 with the aim of empowering participants and inspiring others to keep fighting to stop poverty, find their voice as leaders and to explore the inequalities of poverty in the context of their own lives. This is a creative writing project with an emphasis on the word creative. The UC youth group will welcome submissions from classes, youth groups and individuals. Whether young people take part in a workshop or not, it’s all the same so long as groups follow the guidelines and have fun! The campaign is supported by Dublin Footballer Jonny Cooper, who joined the project as an ambassador. Cooper noted “Having met this group I was struck with their level of self-awareness, empathy and care to provide better future opportunities for young people. 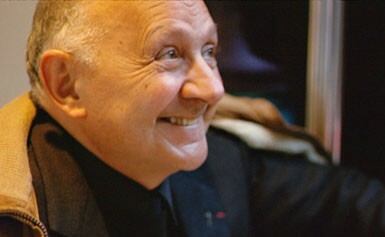 I am delighted to be involved with a determined group of people who are driven to be trail blazers and create change”. The project is co-funded by the Irish Coca-Cola Thank You Fund and the Foundation ATD in Paris. When Voices Unite for Social Justice – Songs to sing along on Social Justice Day! 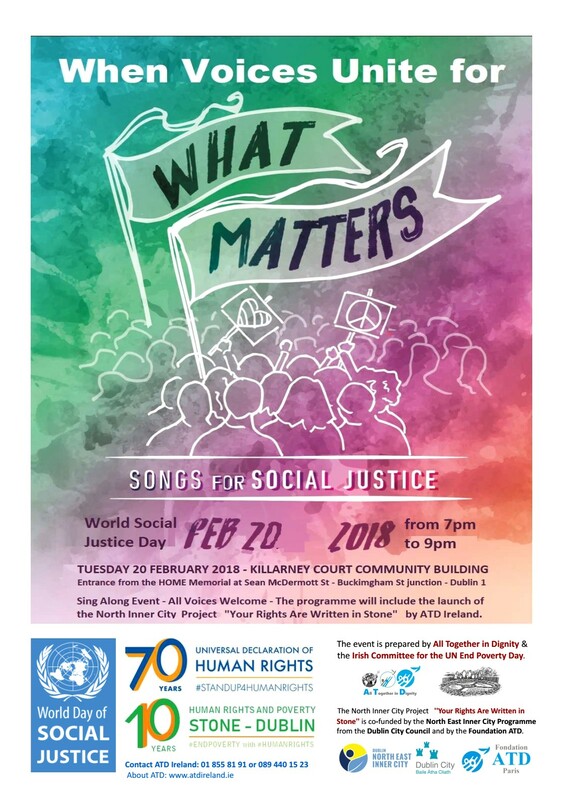 On World Social Justice Day, All Together in Dignity (ATD) invites you to join a “Sing Along Evening” and raise your voice in songs of hope and dignity. The evening is an informal get together with karaoke, guitars and readings of inspiring texts for social justice activists. As 2018 marks 70 years since the proclamation of the Universal Declaration of Human Rights (10 Dec 1948, Paris), the evening will also be the opportunity to launch “Your Rights Are Written in Stone”, a project by ATD in the North Inner City of Dublin. Join ATD volunteers and community activists to sing together “We shall overcome”, “In the name of love”, “how can a poor man stand such times and live”, “Keep your Eyes on the prize”… and many more social justice songs! If you want to prepare yourself to join the songs… here a few recordings performed by our friend Elaine who will help us to sing on the day! And the great finale with Glory! On 14 February 1988, 30 years ago, Joseph Wresinski passed away. He was 71. The evening is an infomal get together with karaoke, guitars and readings of inspiring texts for social justice activists. As 2018 marks 70 years since the proclamation of the Universal Declaration of Human Rights (10 Dec 1948, Paris), the evening will also be the opportunity to launch “Your Rights Are Written in Stone”, a project by ATD in the North Inner City of Dublin. Join ATD volunteers and community activists to sing together “We shall overcome”, “In the name of love”, “how can a poor man stand such times and live”, “Keep your Eyes on the prize”… and many more social justice songs!